Who invented Rubik's Cube? The name of the person credited with inventing Rubik's Cube is Erno Rubik (1944 - Present). The puzzle game was initially called the "Magic Cube" but was renamed after its inventor. Erno Rubik is not only famous as the Hungarian inventor of Rubik's Cube but also as a sculptor and professor of architecture. When was Rubik's Cube invented? Erno Rubik invented Rubik's Cube in 1974, during the Technology and Information Age of inventions. The invention of Rubik's Cube became a global phenonomen as people attempted to solve the puzzle in the shortest times possible. It became the worlds best selling puzzle game, selling over 350 million cubes. Definition of Rubik's Cube: Rubik's Cube is defined as a small, handheld 3-D combination puzzle consisting of a cube of six colors: white, red, blue, orange, green, and yellow. Each face of the cube is made up of nine squares, eight of which are individually rotatable. The objective of the puzzle is to swivel the squares until each face of Rubik's Cube shows only one color. Fact 1: Who invented Rubik's Cube? Rubik's Cube was invented by Erno Rubik in 1974 during the Technology and Information Age of inventions. Fact 2: Who invented Rubik's Cube? Prior to the invention of Rubik's Cube in 1974, two other inventors, Larry D. Nichols and Frank Fox had both invented and had been granted patents on similar types of games. Fact 3: Who invented Rubik's Cube? The inventor of Rubik's Cube, Erno Rubik, was born on July 13, 1944 in Budapest, Hungary. In 1977 Erno Rubik married to Agnes Hegely, an interior architect and together they had four children named Ágnes, Anna, Erno Jr, and Szonja. Fact 5: Who invented Rubik's Cube? The early years of Erno Rubik were spent in Budapest, Hungary where he was raised by his family. His father was Erno Rubik, a flight engineer, and his mother's name was Magdolna Szanto. Fact 6: Who invented Rubik's Cube? 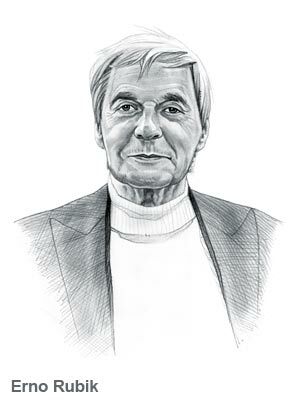 Erno Rubik graduated from at a secondary arts school where he studied sculpture and completed his education at Budapest University of Technology where he studied architecture. Fact 7: Who invented Rubik's Cube? Following his education he taught architecture, integrating art, design and technology in his teaching, at the Department of Interior Design at the Academy of Applied Arts and Crafts in Budapest, Hungary. Fact 8: Who invented Rubik's Cube? Architectural design is based on geometric structures that are built in the correct proportions. Erno Rubik included Geometry in his courses together with the use of 3D forms in construction. To make his classes more interesting Erno Rubik used practical models to demonstrate the theories and ideas. Fact 9: Who invented Rubik's Cube? Erno Rubik's models were made from various, cheap, everyday materials including paper, cardboard, wood and plastic. Fact 10: Who invented Rubik's Cube? In 1974 Erno Rubik built a cube as a teaching tool to teach three-dimensional geometry and help his students understand 3D objects. It was important that his students understood this to enable them to resolve structural problem concerning the movement of independent parts without the entire structure falling apart. Fact 11: Who invented Rubik's Cube? He made a 3x3x3 twisty cube device in which 26 cubes were turning, and twisting independently, without falling apart. His device used 6 different colored stickers that needed to be matched together on each face. His twisty device needed to be turned, the interrelated cubes changed their positions and were scrambled. Fact 12: Who invented Rubik's Cube? Erno Rubik's device looked simple to solve but it took him well over a month to work out the solution to his teaching tool and he realized that he had created a new puzzle game. Fact 13: Who invented Rubik's Cube? Even without explanation the goal of his 3-D teaching tool was self explanatory and fascinated his students and his friends. Once people started playing with the device it was difficult to get them to put it down. Fact 14: Who invented Rubik's Cube? Erno Rubik realized that he had created a really absorbing, addictive puzzle game that kept people interested for hours. What Erno Rubik did not know at the time was the number of different ways that the nine coloured squares could be rearranged. Fact 15: Who invented Rubik's Cube? In later years it was estimated that the Rubik's Cube could in fact be rearranged in 43,000,000,000,000,000,000 (43 quintillion) different ways! Fact 17: Who invented Rubik's Cube? In 1979, Erno Rubik made a deal with a New York based company, called “Ideal Toys” who mass produced the toy puzzle game, re-branded it and called it the ‘Rubik’s Cube’. Fact 18: Who invented Rubik's Cube? In 1980, the Rubik’s Cube made its international debut in toy fairs across the world. Fact 19: Who invented Rubik's Cube? The Rubik's Cube was an instant success and would go on to become the worlds best selling puzzle game, selling over 350 million cubes. Everyone loved to play the game puzzle but it also had educational qualities in VSI (Visual-Spatial Intelligence). Fact 20: Who invented Rubik's Cube? Its educational value in VSI (Visual-Spatial Intelligence), The puzzle game helped to develop skills in relation to strategy, memorization and logistics and improved concentration and problem solving techniques. Fact 21: Who invented Rubik's Cube? Despite the success of the puzzle game Erno Rubik returned to his career in teaching in 1990 when he became president of the ‘Hungarian Engineering Academy’. Fact 22: Who invented Rubik's Cube? In 2009, Erno Rubik was awarded the European Union ‘Ambassador of the Year of Creativity and Innovation’. Erno Rubik will always be remembered as the man who invented the puzzle game that fascinated the world. Who Invented Rubik's Cube - Erno Rubik - Inventor - Invention - Definition - Meaning - Famous - Important - Rubik's History - Rubik's Timeline - Innovation - Significant - Development - Toys and Games - First - Definition - Kids - Facts - Information - Info - Who invented Rubik's Cube - Dates - Rubik's - When - Why - Impact - Purpose - Use - New - Old - Rubik's - Amazing - Best - Definition - Meaning - Awesome - Cool - Hungarian - History - Timeline - Who Invented Rubik's Cube?